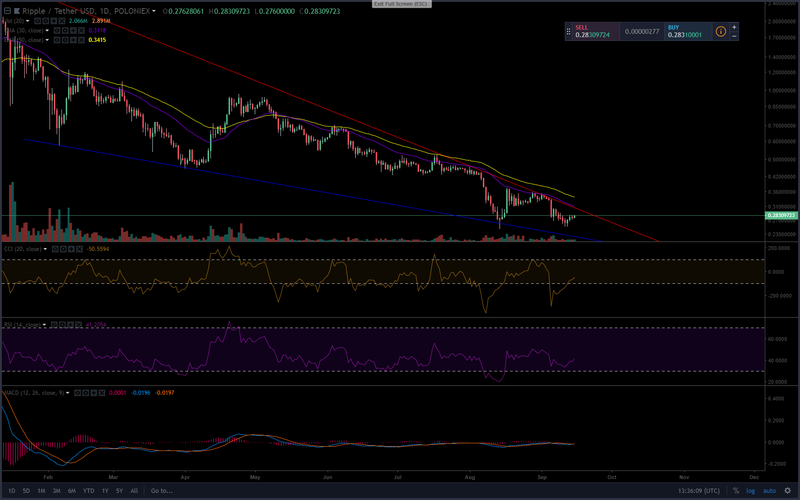 XRP remains inside the large falling wedge, but is producing higher lows on the indicators. Let's take a look at the chart. XRP continues to stay stuck in the falling wedge since its peak of $3.28 in January. Since this time XRP has failed to move above the overhead resistance on many separate occasions showing the power of the bearish posture on the token. Though there is now optimism as XRP is beginning to produce higher lows across the RSI and CCI indicators. With the MACD remaining neutral and volume at low levels we shall still approach positions in XRP with caution, especially as the token has begun to rise toward not only the long-term resistance line but the 30 & 50 EMA as well. XRP is looking to face stiff resistance from the bears from $0.29 all the way to $0.34. With so many failures for XRP to break above the resistance we will not be taking any positions until XRP demonstrates an ability to hold above the 50-EMA at $0.34 for a period of three days. Then we will consider longing the token.